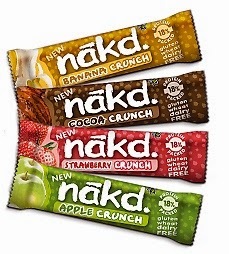 I first discovered Nakd snack bars back in early 2012. Since then, they’ve been my ‘sweet snack of choice’ ever since. Fortunately, the Nakd brand produced by British company, Natural Balance Foods, is still growing strong, with an increasing range of new snacks. Among these are Nakd’s range of Protein Fruit and Nut Bars. 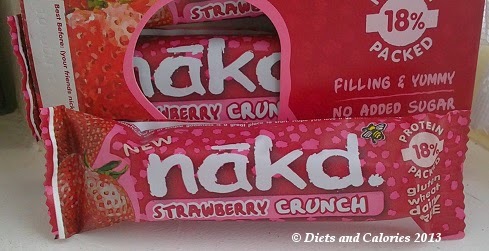 Back in 2013 I reviewed the Nakd Strawberry Crunch. But now there are another three varieties to choose from. 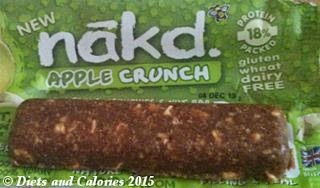 Nakd’s Protein Crunch bars weigh 30g and flavours are: Cocoa Crunch – 106 calories, Banana Crunch – 104 calories, Apple Crunch – 108 calories, and the Strawberry Crunch with 109 calories. I've now tried all of the Protein Crunch bars and am totally hooked. The soya bits give the whole bar a lovely, crunchy texture, while still retaining the chewiness of the dates. 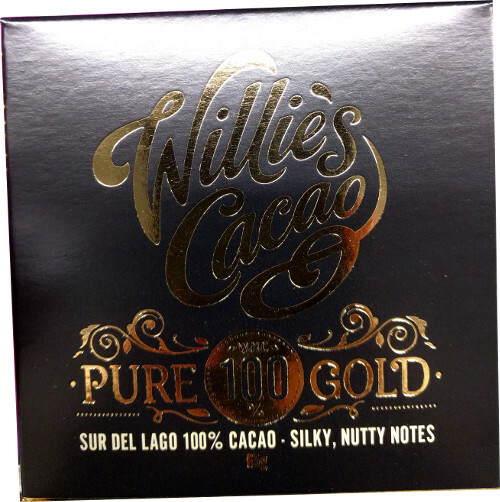 The respective fruits or cocoa give each variety a unique taste of its own. My favourite is the Apple Crunch, closely followed by the Banana Crunch. For those who are trying to break a chocolate addiction or move away from highly processed snacks, I highly recommend Nakd Protein Crunch bars as a substitute. Although high in sugar, it's natural sugars present in the dried fruit rather than the refined kind. Nakd Crunch bars are a source of protein with 5.5g per bar. This can be useful for for vegans who may find it difficult getting enough protein into their diet. My children are more than happy to snack on these bars, but I do have to watch out as they’ll happily devour more than one bar in a short space of time! 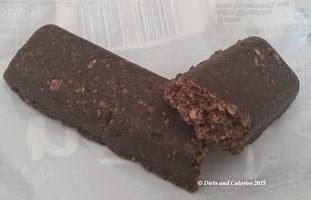 The Protein Crunch Bars are available as individual bars or in packs of 4. However, you can buy a mixed case of 18 Protein Bars from their makers – Natural Balance Foods. 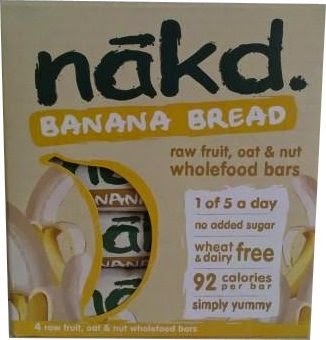 Originally I reviewed the range of Nakd raw fruit, oat and nut bars as these had the lowest number of calories. 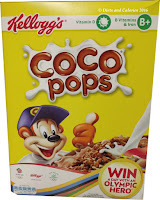 While the Coco Loco isn't available any more, the Berry Cheeky, Banana Bread and Apple Pie can still be found. 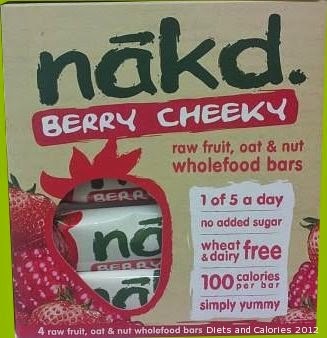 It’s great to see that Nakd Bars are widely sold by the checkout counters now. Tesco for example, are selling the Nakd Crunch bars by the self service checkouts with the unhealthy chocolates being relegated to the end of aisle display area. 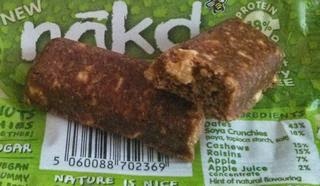 Most major supermarkets sell Nakd bars and you’ll also find them in Health Food stores. 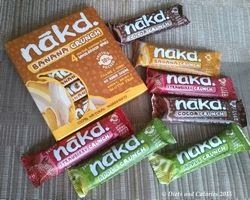 If you’re living outside of the UK, the great news is Nakd bars are delivered abroad to various stockists. Countries include, The Netherlands, Australia, Sweden, South Africa, Hungary, Latvia, Lithuania, Estonia, Bulgaria, Malta, Spain, Sweden, Switzerland, Norway, UAE, Greece, Kenya and Slovenia. You can find out more information on who to contact at Natural Balance Foods. For those with particular health concerns or dietary requirements, Nakd Protein Crunch bars are dairy free, wheat and gluten free, vegan friendly, low in saturated fats, free from added sugar and syrups, GM free and Kosher approved. 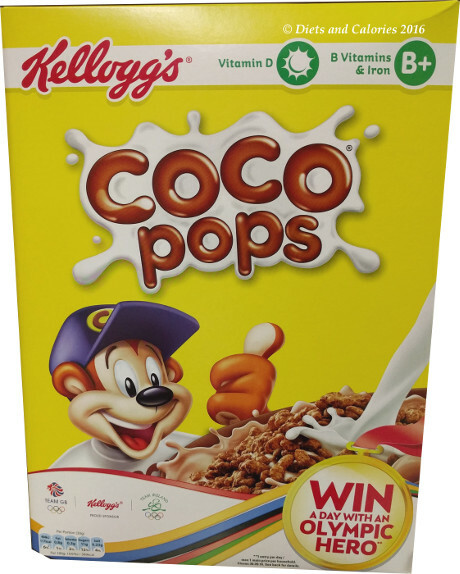 Cocoa Crunch Nutrition Information per 30g bar: 105 calories, 5.5g protein, 14.2g carbs, 12.9g sugars, 2.6g fat, 0.6g saturates, 1.9g fibre, 0.6g salt. Banana Crunch Ingredients: Made with Dates, soya protein crunchies (soya, tapioca starch, salt) (18%), cashew nuts, raisins, dried banana (6%), apple juice concentrate, banana flavouring. Banana Crunch Nutrition Information per 30g bar: 103 calories, 5.5g protein, 14.4g carbs, 13.3g sugars, 2.4g fat, 0.5g saturates, 1.3g fibre, 0.2g salt. Apple Crunch Ingredients: Made with Dates, soya protein crunchies (soya, tapioca starch, salt) (18%), cashew nuts, raisins, dried apple (6.5%), apple juice concentrate, Bramley apple flavouring. Apple Crunch Nutrition Information per 30g bar: 108 calories, 5.5g protein, 15.2g carbs, 13.7g sugars, 2.4g fat, 0.5g saturates, 1.6g fibre, 0.1g sodium. Strawberry Crunch Ingredients: Made with Dates (43%), Soya Crunchies (soya, tapioca starch, salt) (17%), Cashews (17%), Raisins (17%), Strawberries (2%), Apple Juice Concentrate (2%) and a hint of natural flavouring. Strawberry Crunch Nutrition Information per 30g bar: 107 calories, 5.5g protein, 14.8g carbs, 13.4g sugars, 2.7g fat, 0.5g saturates, 1.4g fibre, 0.2g salt.